These are my favorite comics of 2013, including manga, superheroes, graphic novels, reprints, etc. I try to be as true to how I feel about a book as possible when ranking them, which is why it may seem odd for some to see a superhero title hardly anyone read rank over an acclaimed graphic novel. If I enjoyed my experience of reading it more, it was placed higher on my list. Anyways, these are my favorite twenty comics of the year. I hope you enjoy my list, and hopefully check out some books that may have eluded you. 20. 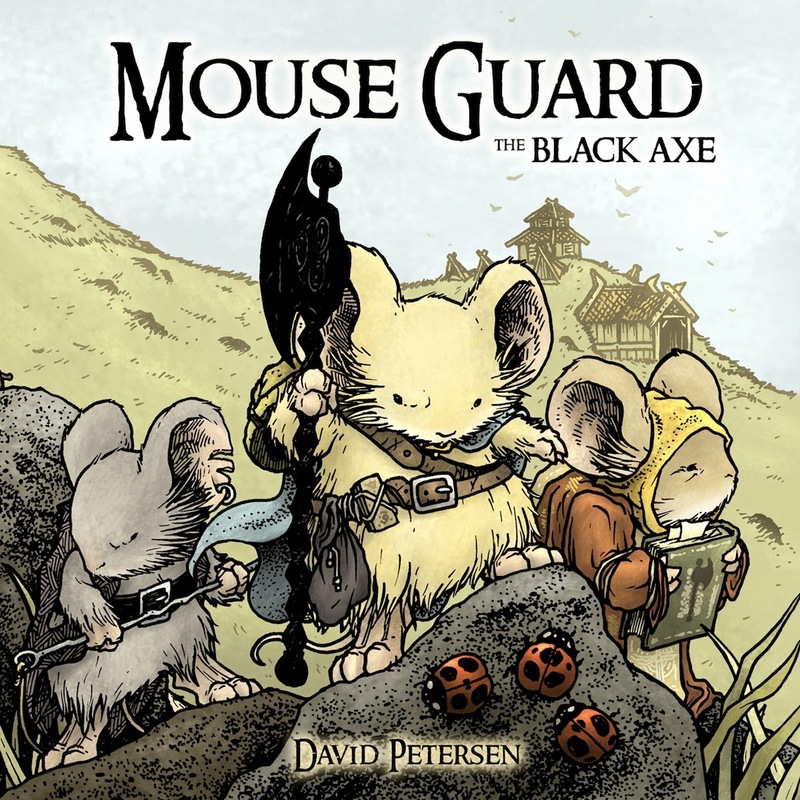 Mouse Guard: The Black Axe (David Petersen) - Petersen takes us back in history to tell the tale of the mouse who wields the black axe, and his confrontation with the sinister weasels. The fantasy feel and cute designs of the mice make this title irresistible, but it's really Petersen's consistently amazing pencils that make this series such a stunning read. 19. Wonder Woman (Brian Azzarello, Cliff Chiang & Tony Akins) - Wonder Woman is the only DC Comic that remotely stands out from the others currently. Azzarello has breathed new life into the title with his unique pantheon of gods, and Wonder Woman's place among them. Meanwhile, the art is top-notch and not the cookie cutter 90's art that seems to plague DC's other 51 titles, keeping this title fresh and relevant, while the rest of DC flags. 18. All New X-Men (Brian Michael Bendis & Stuart Immonen) - Time travel has been a staple to the X-Men titles for a long time now, so when Bendis decided to bring the original five X-Men into the current timeline, it seemed like a no-brainer, but it made for a really interesting dynamic. I love the interactions between the originals and the new X-Men, particularly when it comes to a young Scott Summers and the long-dead Jean Grey. 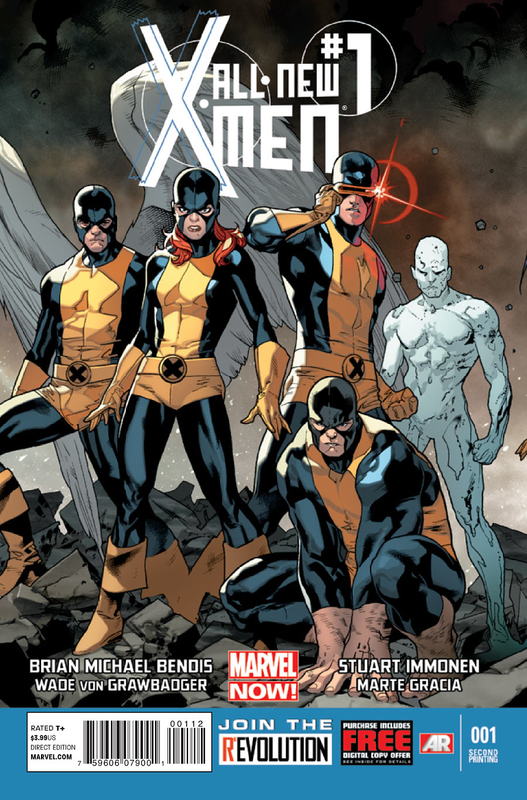 It will be interesting to see where this title goes now, with the X-Men so fractured, but it seems that Bendis' creativity knows no bounds, so I'm not worried in the least. 17. 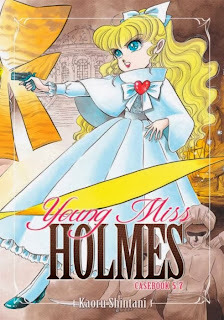 Young Miss Holmes (Kaoru Shintani) - The final volume of Shintani's fun manga following Sherlock's smart and proper niece, and the mysteries that she helps him solve, ends the series with a bang, tying in to her family and raising the stakes substantially. Mysteries abound in this thrilling book, illustrated beautifully, and packed full of action and intrigue. 16. Attack On Titan (Hajime Isayama) - The twists keep coming in this post-apocalyptic story about the remnants of humanity surviving behind walls that keep out man-eating giants. 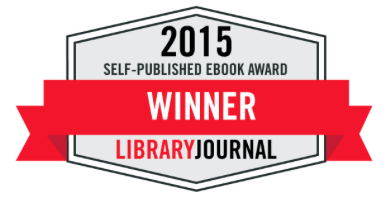 This series is bloody and action-packed, and utterly nail-biting as things really go awry. There is plenty of mystery in this series to keep readers coming back for more, between some pretty amazing action sequences. 15. Smurfs (Peyo) - The Smurfs continue to get into mischief in these ridiculously cheap Papercutz editions of Peyo's Smurfs stories. With Christmas specials and new smurfs coming into the mix, the stories continue to feel fresh, while the all-ages tales keep consistently entertaining. 14. The Strange Tale of Panorama Island (Suehiro Maruo) - This story is a little odd, but I like that. Hitomi is a misunderstood novelist who fakes his death to take the place of an heir who recently died. Using the heir's fortune, he makes his wildest dreams come to life on a pleasure island, where people can take strolls under the sea, frolic with beautiful women, and enjoy some breathtaking scenery. A lot of this book is just a tour through the island at the end, but there's quite a bit of tension leading up to that as well, and frankly, Maruo's art is the major draw here, as it is phenomenal. Very realistic and lush. 13. 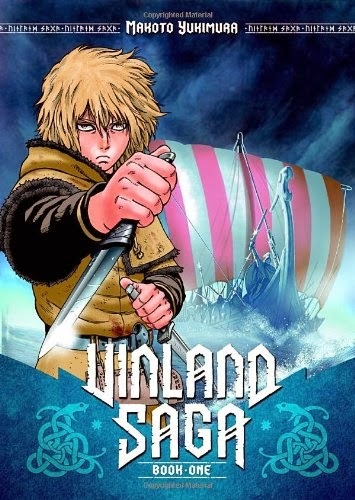 Vinland Saga (Makoto Yukimura) - This truly is a saga, featuring castles being stormed by waves of Viking warriors, ambushed ships at sea, and challenges of one-on-one combat. Vinland Saga tells the story of Vikings as they wage war and make merry, but also a look at their everyday lives, and tragic, bloody history. Yukimura's artwork is clear and well-suited for this historical action story, moving the events along cinematically, and sweeping readers up in its grandeur. 12. Gunnerkrigg Court (Volume 4): Materia (Thomas Siddell) - While this is the weakest entry in the Gunnerkrigg Court series of all-ages fantasy comics, it's still an imaginative, entertaining read. Thomas Siddell's pencils continues to grow as do his characters, who seem much more mature than when we started out with them. Siddell continues to build on the mythology he's created in a spectacular series with characters that are hard to forget. 11. 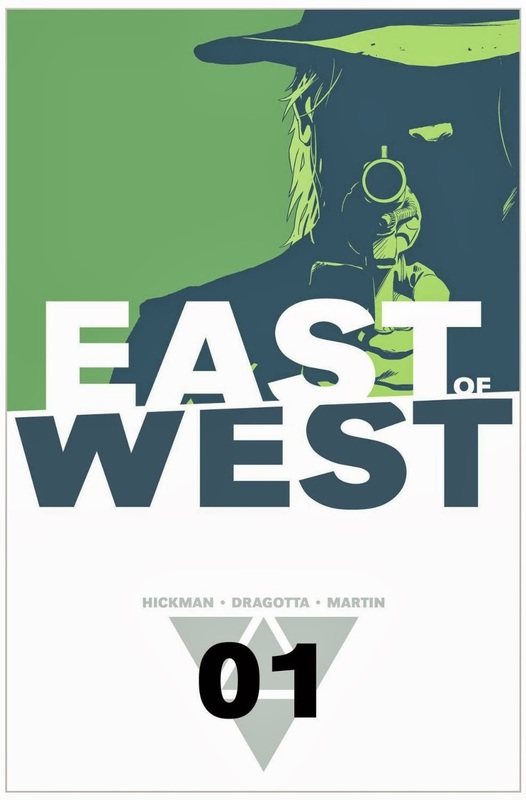 East of West (Jonathan Hickman & Nick Dragotta) - This is the four horsemen as you've never seen them before. Hickman creates a wild, steampunk world full of unique characters with conflicting agendas, making for great action scenes that Dragotta draws the hell out of. 10. Love & Rockets: New Stories #6 (Jaime Hernandez & Gilbert Hernandez) - While Gilbert continues to offer a fascinating look into characters from his Palomar universe (and a weird short about a big-breasted furry monster and some magic boots), Jaime takes a look at a family dealing with a husband-killing mother, and flushes out some characters that usually don't get much of the spotlight. Terrific art, great character studies. 9. Hawkeye (Matt Fraction, David Aja & Various) - This smart, street level superhero comic has a great cast of characters in what have come to be witty, thrilling stories. David Aja offers amazing artwork on this title, often with clever panel arrangements, while Fraction breathes life into Hawkeye and his fascinating supporting cast. 8. The Heart of Thomas (Mato Hagio) - We saw a collection of work released from Shojo master Mato Hagio a few years ago in Drunken Dreams and Other Stories, thanks to Fantagraphics, and now they've released perhaps her best known works. The Heart of Thomas is a mystery that takes place at a boys' board school in Germany, beginning with a suicide, and the beautiful boy who looks uncannily like the deceased. It's a haunting story, brimming with emotion and complex relationships between the boys, but it's Hagio's delicate breathtaking beautiful line work that really brings this story to another level altogether. 7. 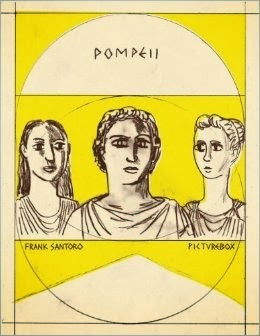 Pompeii (Frank Santoro) - Santoro can draw the hell out of a comic when he wants, but he seems more interested in experimenting with art and setting atmosphere and mood, something that makes Pompeii resonate so much. Revolving around the lives of an artist and his apprentice leading up to the catastrophic volcanic eruption that destroys a lively city, Pompeii paints a picture of very real characters caught up in their own lives before nature crushes them, and leaves quite an impression in its wake. 6. Benny Breakiron (Peyo) - From the creator of Smurfs comes the story of a boy with superpowers, if anyone would believe him! Thwarting thieves, and helping those in need, Benny Breakiron is a mischievous kid who is a magnet for trouble, so it's a good things that he's strong and fast (except when he has a cold, that is). This is a funny all-ages title with captivating stories that anyone can fall in love with. 5. 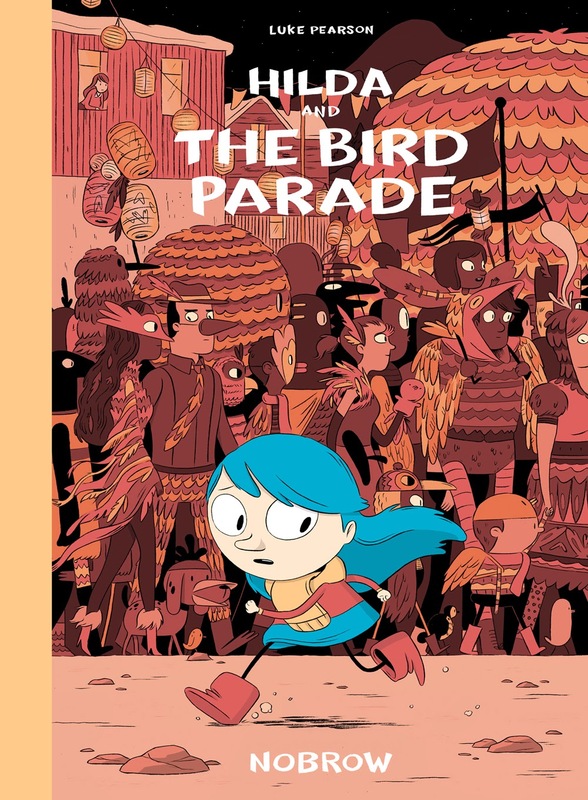 Hilda and the Bird Parade (Luke Pearson) - The blue-haired Hilda moves to the city with her mother and finds herself depressed, given that she's used to the nature spirits and magical creatures of the countryside. But Hilda finds her own magic in the city in the latest graphic novel from Luke Pearson, whose all-ages comic is drawn beautifully, with great designs and lush backgrounds and panels. 4. Wolverine & the X-Men (Jason Aaron, Nick Bradshaw, Chris Bachalo & Various) - This wacky series featuring Wolverine's school for mutants is a highlight for me every time it comes out. I never know what to expect, aside from quality. I love the vast cast of characters, particularly the students created especially for this series. It really is one of the most unique superhero comics to come along in awhile, and it's going to be sad to see Jason Aaron leave the title next year. 3. 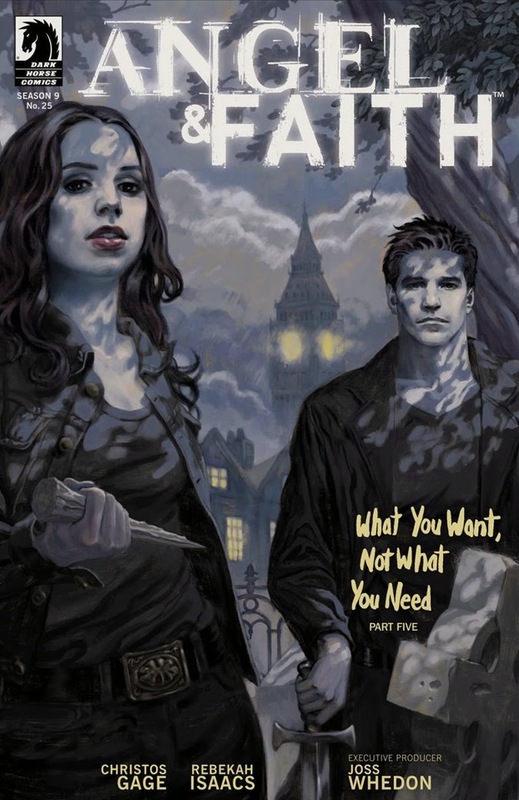 Angel & Faith (Christos Gage & Rebekah Isaacs) - Overshadowing the main book in the Buffy, the Vampire Slayer: Season Nine universe, this shockingly high quality title features great art from Isaacs, who make the characters we know and love her own, and stories that flush out the best of the characters, delving into the pasts of these conflicted, layered characters, on their path to redemption. 2. The Twin Knights (Osamu Tezuka) - This sequel to Tezuka's groundbreaking Princess Knight offers readers a sweeping epic story of love, betrayal and another princess pretending to be a prince for the sake of her kingdom! Magic and assassins conspire to keep Princess Violetta from her twin brother, and threaten to destroy her family, in this romantic, action-packed story. 1. 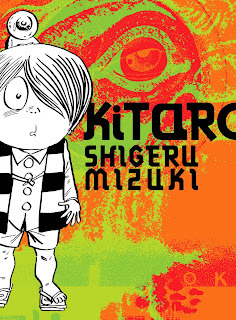 Kitaro (Shigeru Mizuki) - Shieru Mizuki is known for specializing in stories about yokai, and this collection really showcases his strength in that area. A Japanese pop culture figure, Kataro is a one-eyed monster boy with special powers, and a knack for dealing with pesky yokai. Mizuki weaves wonderful stories here, full of monsters and demons, some genuinely creepy with images that will stay with you, and others more light-hearted and funny. This impressive omnibus edition that Drawn & Quarterly has released is the perfect introduction to this rambunctious character and the crazy life he leads, earning the title of my favorite comic of the year. 2013 saw a lot of great manga, from beautifully packaged products featuring classic manga masters, to excellent volumes of new ongoing titles. It's always hard to narrow down my favorites to just ten books, but I've done just that in the following list. The top books on this list will also be featured in my forthcoming overall best comics of 2013 list. 1. 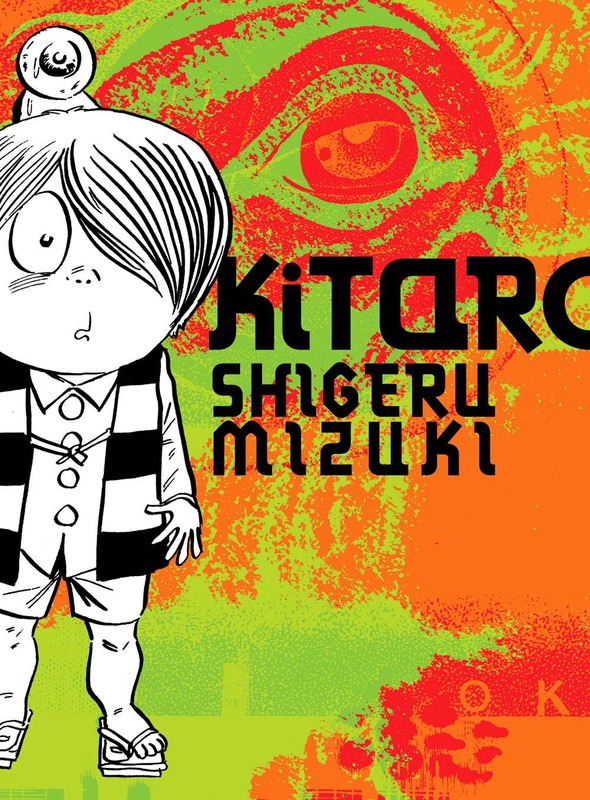 Kitaro (Shigeru Mizuki) - Shieru Mizuki is known for specializing in stories about yokai, and this collection really showcases his strength in that area. A Japanese pop culture figure, Kataro is a one-eyed monster boy with special powers, and a knack for dealing with pesky yokai. Mizuki weaves wonderful stories here, full of monsters and demons, some genuinely creepy with images that will stay with you, and others more light-hearted and funny. This impressive omnibus edition that Drawn & Quarterly has released is the perfect introduction to this rambunctious character and the crazy life he leads, and easily fits the bill for best manga of the year. 2. The Twin Knights (Osamu Tezuka) - A follow up to the classic Princess Knight, Tezuka once again forces a heroine into men's clothing as two twins are separated at birth and a kingdom is at stake. Like Princess Knight, this story is epic, and takes readers on a magical journey through different landscapes, meeting all sorts of strange people, before culminating in a breath-taking climax. 3. 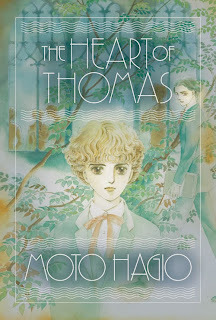 The Heart of Thomas (Mato Hagio) - We saw a collection of work released from Shojo master Mato Hagio a few years ago in Drunken Dreams and Other Stories, thanks to Fantagraphics, and now they've released perhaps her best known works. The Heart of Thomas is a mystery that takes place at a boys' board school in Germany, beginning with a suicide, and the beautiful boy who looks uncannily like the deceased. It's a haunting story, brimming with emotion and complex relationships between the boys, but it's Hagio's delicate breathtaking beautiful line work that really brings this story to another level altogether. 4. Vinland Saga (Makoto Yukimura) - This truly is a saga, featuring castles being stormed by waves of Viking warriors, ambushed ships at sea, and challenges of one-on-one combat. Vinland Saga tells the story of Vikings as they wage war and make merry, but also a look at their everyday lives, and tragic, bloody history. Yukimura's artwork is clear and well-suited for this historical action story, moving the events along cinematically, and sweeping readers up in its grandeur. 5. 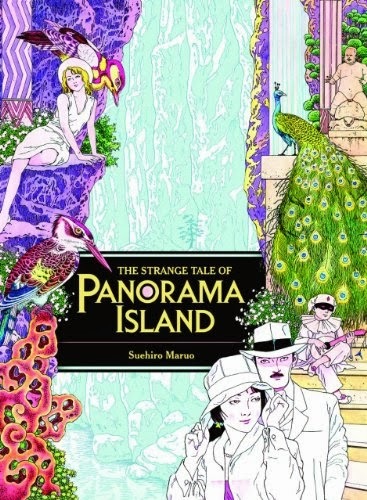 The Strange Tale of Panorama Island (Suehiro Maruo) - This story is a little odd, but I like that. Hitomi is a misunderstood novelist who fakes his death to take the place of an heir who recently died. Using the heir's fortune, he makes his wildest dreams come to life on a pleasure island, where people can take strolls under the sea, frolic with beautiful women, and enjoy some breathtaking scenery. A lot of this book is just a tour through the island at the end, but there's quite a bit of tension leading up to that as well, and frankly, Maruo's art is the major draw here, as it is phenomenal. Very realistic and lush. 6. 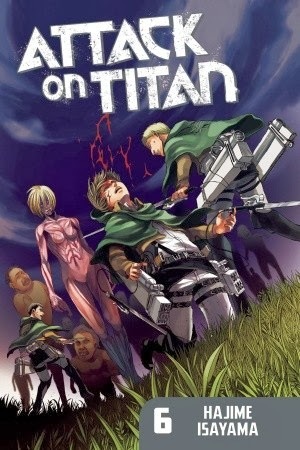 Attack On Titan (Hajime Isayama) - The twists keep coming in this post-apocalyptic story about the remnants of humanity surviving behind walls that keep out man-eating giants. This series is bloody and action-packed, and utterly nail-biting as things really go awry. There is plenty of mystery in this series to keep readers coming back for more, between some pretty amazing action sequences. 7. Young Miss Holmes (Kaoru Shintani) - In Victorian London, Christie continues to help her uncle Sherlock Holmes crack some difficult cases, while balancing her hobby with becoming a real lady. Often very witty, and illustrated beautifully, this is a great mystery series that features plenty of action and unforgettable characters. 8. Gold Pollen and Other Stories (Seiichi Hayashi) - This release from PictureBox showcases some lovely work from alternative manga artist Seiichi Hayashi, whose work we've seen previously in Drawn & Quarterly's release, Red Colored Elegy. There are four stories collected here, with Hayashi experimenting with his style for different experiences with each. I love Hayashi's use of color, especially when it's used sparsely in the later stories, although my favorite of the four offerings is the one full-color story, "Dwelling in Flowers," examining a relationship between mother and son. I didn't really care for "Yamanba Lullaby," but otherwise, even the short "Red Dragonfly" was a moving short work. Hayashi is very subtle about things, which I like, and the stories feel more real because of it. 9. Soulless (Gail Carriger & Rem) - Continuing the adaptation of Gail Carriger's novels, Rem illustrates the lush environments of Victorian England in this steampunk series, transporting readers to this world with stunning, detailed illustrations. 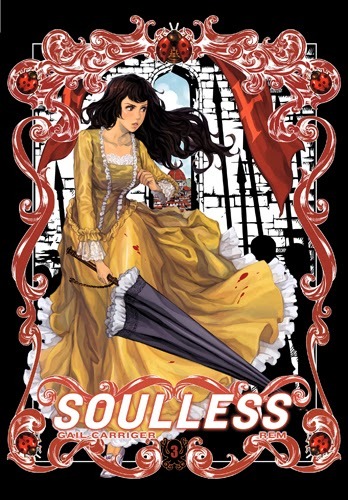 Alexia keeps getting into trouble with supernaturals in this book full of conspiracies and the politics of vampires and werewolves in a very proper society. 10. Atomcat (Osamu Tezuka) - This all-ages title from master Osamu Tezuka brings his most famous creation to the limelight again, in an unusual way. Tsugio, who is bullied at school, takes refuge in the Astro Boy stories he reads with his father, and when he takes in a kitten with a slight resemblance to Astro Boy, circumstances lead to the cat's alteration into a super kitten, protecting Tsugio from bullies on all sorts of adventures. This book is lots of fun. Cute and heartfelt, and perfect for manga fans of any age.